Tom, the owner of Independent Insurance, had contacted us several months ago in reference to getting a website created for his insurance agency. Tom was not in a rush to get the site completed and so there were some periods were a month or more passed by without receiving any updates or requests from him to be changed on the site. Today, we have went ahead and published the site since we have not done any updates on the site for quite some time. He is paying for the website hosting costs but wasn’t able to use the site since it wasn’t fully published – so we felt it was best to publish the site so he could start using it for his business. 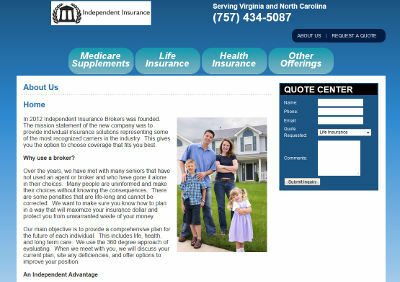 The Independent Insurance website is at independentinsurance123.com.